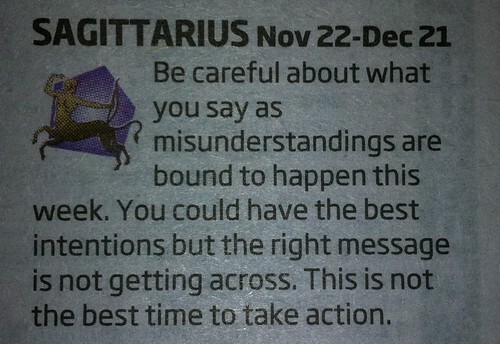 Please note the above horoscope, if you feel that I have offended you in anyway, you may be a victim of the stars. They are apparently causing misunderstandings, totally neglecting my intentions and preventing my messages from getting across. It is as if there is some sort of “Cosmic Chinese Whispers” occurring. Please note this in any further communication with myself or other Saggitarians. « Talking to myself again?